This is a group of people that have used pregnant women, children and special needs individuals with mental handicaps to carry their suicide bombs into public places before detonating them. With that in mind, it is no surprise that they were willing to use a puppy as their next living sacrifice to bring death to large groups of innocent people. 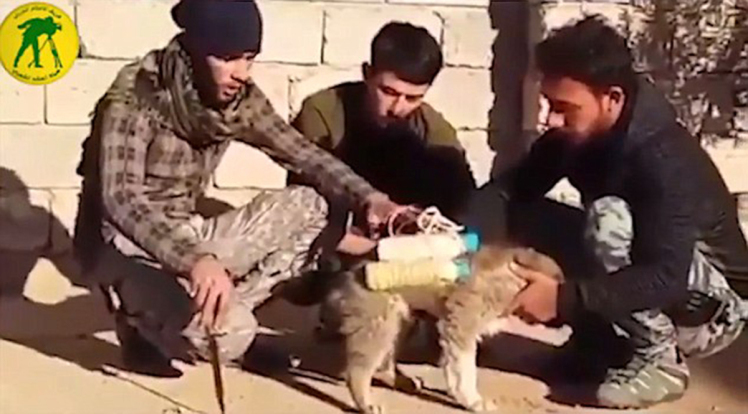 A recent video released shows a group of young men using a small puppy dog as a carrier for a homemade bomb. They are seen tying the makeshift bomb to the puppy’s back. The PMU fighters, from a militia backed by the Iraqi government, say they successfully deactivated the bomb and that the dog will be sent to Baghdad Zoo ‘for a nice break from the war zone and well away from Isis fighters trying to blow animals up for their sick war. As they are pushed back by forces including the Iraqi army, Kurds, Shia militias, America, the UK, Turkey, Saudi Arabia, Russia and Syria (not all working together), Isis fighters have turned to new methods to retain the territory they control. This is exactly the type of madness that is threatening America. It is no wonder that people from these countries are researched more seriously before being allowed to move to America. Doesn’t it make sense to help ensure our country never experiences these same horrors? ?